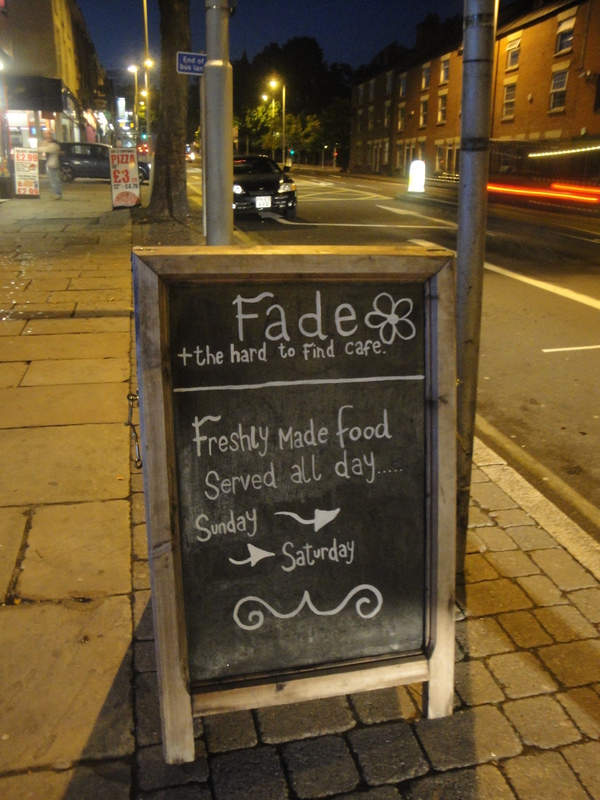 Fade and the ‘Hard to Find’ Café is on Mansfield Road just up past the Lincolnshire Poacher Pub. To be honest it is pretty easy to find, but the Friday evening when we visited it seemed quite quiet so perhaps it was not as easy for everyone else. Having said that it was early and perhaps this was one of those places that the beautiful people hunt out later in the night. Inside it is a cross between some sort of Greek taverna and a French sidewalk café, it was hard to believe that you were only yards away from the dust and dirt of the Main Road and the buses and traffic hurtling up and down the hill to and from the city. It is a bit of a conflict to the senses. 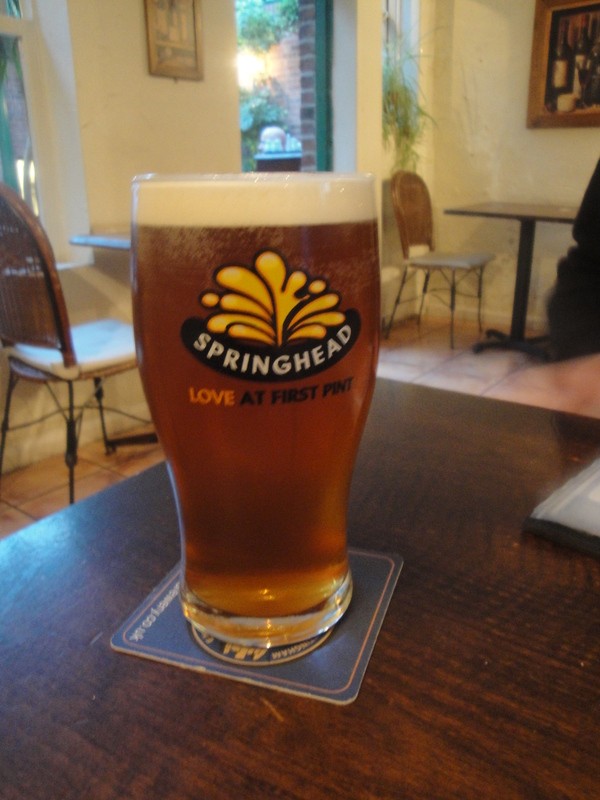 We were not to be distracted though from the task in hand, principally hunting out some new places for food in Nottingham, and it all started to look a lot brighter when we saw the beer pump for the Springhead Brewery. If you are not familiar with this micro-brewery based out of North Nottinghamshire then perhaps you should become acquainted, on their website they tell us that “it will be ‘Love at first pint’ when you taste one of our range of beers”. The beer in question was the Roaring Meg which is a smooth golden pale ale, described as having “a sweet, citrus honey aroma and a long dry finish”. It really is very quaffable and as for all the offerings from the Springhead Brewery I have to say that they are really good beers and on the night it was the presence of that beer pump at the bar that persuaded us to stay in the bar, after all if they can select such good beer, then perhaps there may be some hope for the food that they serve as well. 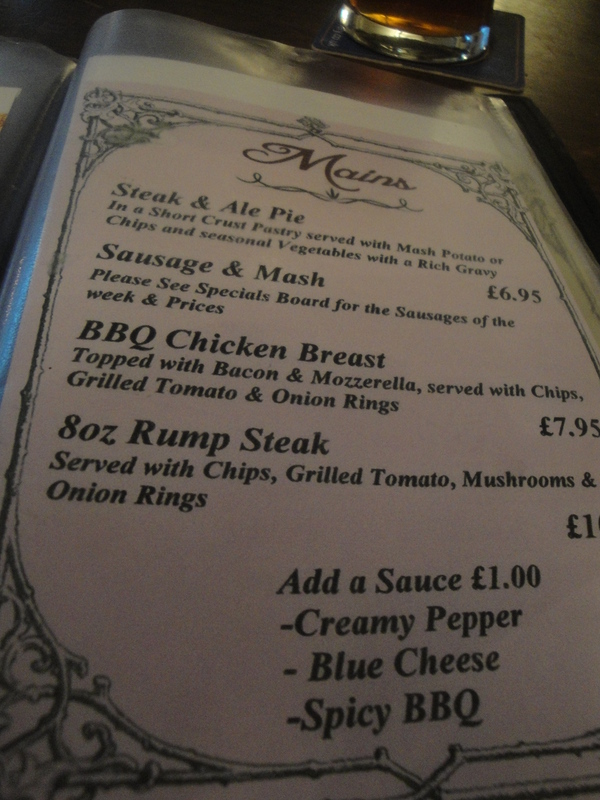 The laminated menu maintained the illusion of a cheap Greek Taverna from any one of the dirth of Greek Island holiday resorts that we may have visited in the 70’s and 80’s. We were not too fussed at hunting out anything too fancy and so we found ourselves gravitating towards the sandwich and burger end of the menu. 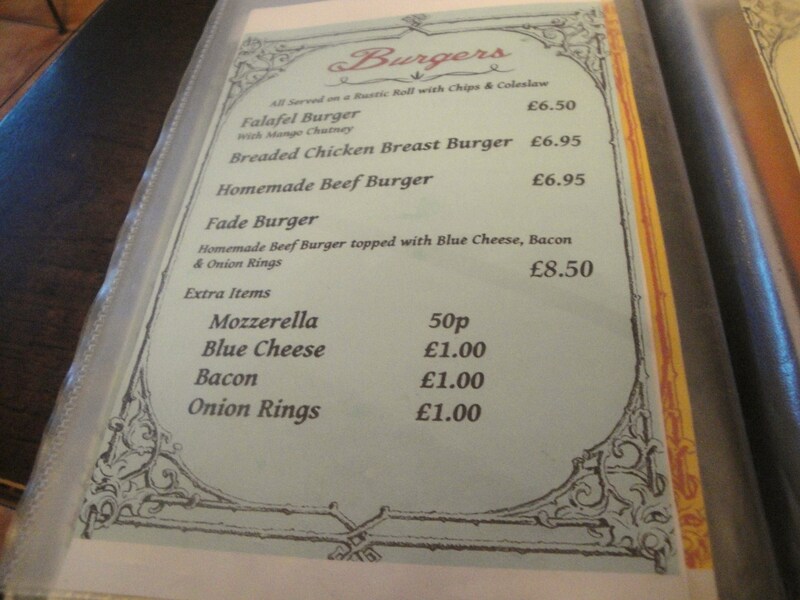 We ended up ordering one of the Fade Burger’s which was described on the menu as a “Homemade Beef Burger topped with Blue Cheese, Bacon, and Onion Rings” for £8.50, and one of the House Beef Burgers for £6.50 with additional toppings of bacon and Mozzarella cheese. 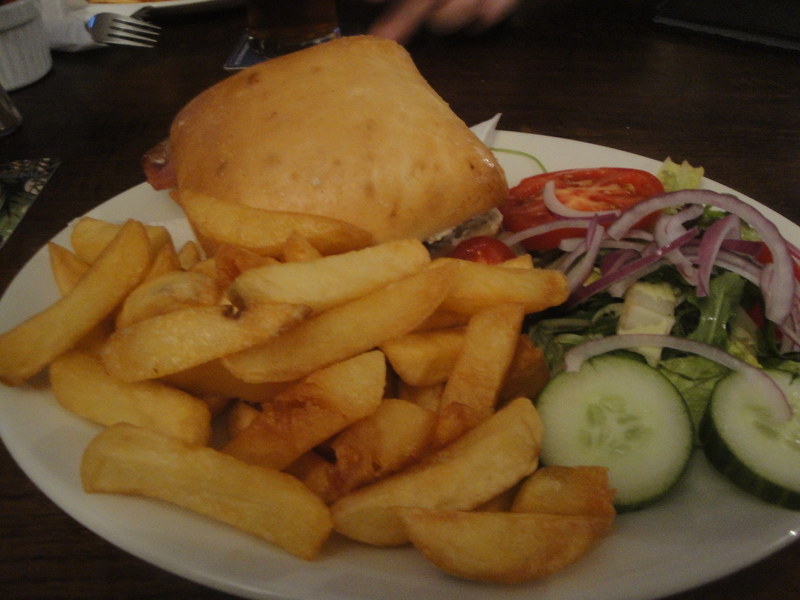 Both came served with chips and a basic green salad with red onion, tomato, and cucumber. 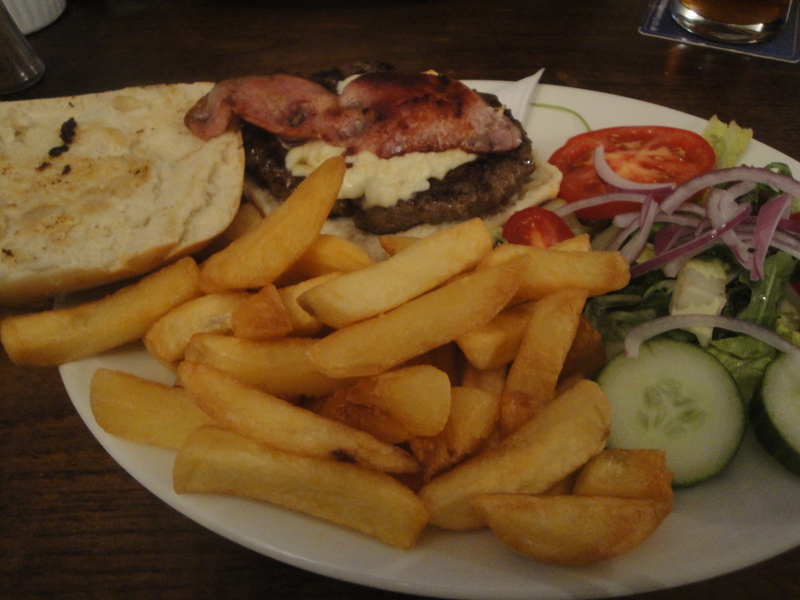 In all honesty which were not sure what to make of these burgers, they were very eatable but they just seemed to be, well old fashioned, that might be the best way to describe them. There is nothing wrong with them, yet nothing to write home about either. I want to think of something to get excited about as this is such a quirky place to hang out in, but I just cannot quite fathom what was missing from the experience. I think it was Neil deGrasse Tyson who said “In the animal kingdom, one of the keys to survival is to outwit your enemies. And when you’re surrounded by carnivores, one of the best strategies is to fade into the background and disappear.” perhaps that is what these burgers were doing in an attempt to avoid all of us hungry diners? They had good flavor, and the ciabatta bread roll gave a good solid bite to the whole sandwich, the bacon was nice and crisp and the cheese added a nice salty element to each mouthful. Overall the meal did its job of soaking up a little of the Friday night alcohol and the Fade café beneath the large glass skylight was quite a nice space to sit a while and partake of some light refreshment and an early evening bite of food. 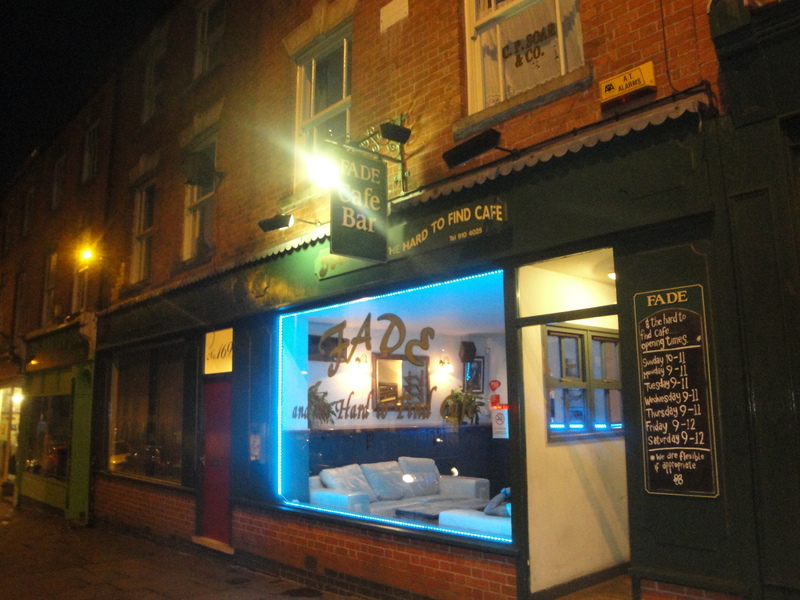 The Fade and the Hard to Find Café is located at 171 Mansfield Road and is serviced by a number of bus routes from Nottingham City Centre up the hill towards Sherwood and Arnold.